can be created and die off in just two to six days. Because the cells multiply and die so quickly, they build up on the surface of your skin and cause red plaques to form. Psoriasis is most common on the elbows, knees, and scalp, but it can also appear on the hands, torso, soles of the feet, or other parts of the body. There are a wide variety of other skin conditions that can cause redness or rashes, so it’s important to understand what psoriasis looks like, who’s at risk for developing the disease, and what triggers it. This can help you figure out whether you have psoriasis or a similar skin condition. Psoriasis affects about three percent of the world’s population. Men and women are equally likely to get the condition, and it’s most likely to first develop when you’re in your 20s or 50s. Anyone can get psoriasis, but certain factors can increase your risk of developing the disease. The most important risk factors is genetics. There are three specific genes associated with psoriasis, so a family history is a sign that you may be at risk. Having one or both parents with the disease gives you the greatest risk, but having any family member with the disease could mean that you carry the gene. Having a family history or carrying the psoriasis genes aren’t guarantees that you’ll experience psoriasis. A very small fraction of people who carry the gene actually develop the disease. To develop psoriasis, something will have to trigger an outbreak. This could be a skin injury, a bad sunburn, a reaction to a medication, or a number of other things. If you have the psoriasis genes, some other risk factors can increase your chances of developing the disease. Obesity puts you at a greater risk because extra fat creates more skin folds and creases on your body, which can lead to inverse psoriasis. Smoking is another major risk factor that can cause the condition to develop and can make existing psoriasis worse. One study in 1999 found that smoking doubles the risk of psoriasis. Smoking increases the risk for women more than men, but both genders can develop psoriasis as a result of smoking. It’s important to remember that psoriasis isn’t contagious. Even if you carry the genes that cause psoriasis, touching or being near someone with the condition will not make you develop it. 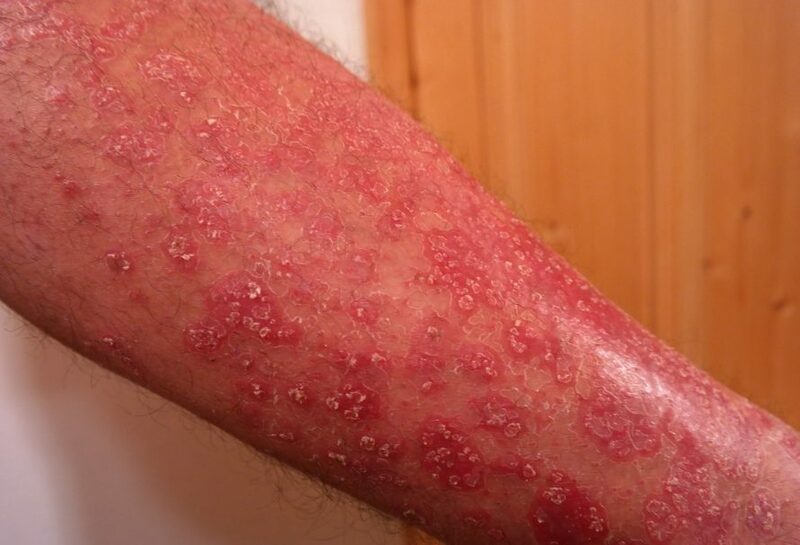 At the beginning of an outbreak, psoriasis causes small red bumps to form on the skin. Over time, these bumps can turn into large patches of raised skin, which are called plaques. Sometimes, the patches will be covered in white or silver scales. They may be feel itchy, inflamed, or painful. Psoriasis plaques on the elbows, knuckles, or other areas that bend and move frequently may crack open and bleed, or they may bleed easily from scratching. The scalp is one of the most common places to develop psoriasis. An outbreak may look like severe dandruff because of the white flakes that form. However, psoriasis flakes are usually larger than dandruff, and they won’t go away with a dandruff shampoo. Some types of psoriasis affect the fingernails and toenails as well as the skin. About 50 percent of people with the condition have pitting of the nails, which are depressions in the nail’s surface caused by defective development. In severe cases, the nails may crumble or completely detach from the nail bed. Doctors aren’t always sure of the exact trigger of psoriasis. The condition is an autoimmune disease, so it causes your immune system to attack its healthy cells. Experts think that it’s a issue with T cells, which are a type of white blood cell. These cells are supposed to defend your body against viruses, bacteria, and other dangerous invaders. When you have psoriasis, T cells attack your skin instead, triggering it to produce too many healthy skin cells. This autoimmune response happens as a result of genetic and environmental factors. Most people with psoriasis have periods of remission where the rashes mostly or entirely go away. However, once the disease has developed, you’ll always have it. Some lifestyle or environmental factors can trigger flareups that cause the painful skin patches to come back. One of the most common triggers is a skin injury like a sunburn, bug bite, or scrape. When your body has to produce healthy skin cells to heal the injury, it may go into overdrive and start overproducing cells. Viral or bacterial infections are another common trigger. To fight off these infections, your immune system has to work harder than usual. As a result, it may also start attacking your skin cells harder. Any infection could cause a psoriasis flareup, but strep throat is especially risky. Smoking and heavy drinking can cause flareups and can worsen any existing psoriasis patches on your skin. Some medications can also trigger the disease. High blood pressure medicines, antimalarial drugs, and lithium have all been known to cause flareups. Your body may try to cope with mental or emotional stress with inflammation, especially if you have an autoimmune disease like psoriasis. Managing your stress could prevent flareups and keep the skin rashes under control. It can be difficult to avoid stress, though, and the psoriasis itself is a big source of stress for many people. Practicing stress-relieving techniques can prevent you from triggering or worsening the condition. Meditation is one of the best ways to relieve stress and improve your emotional health. There are a wide variety of meditation exercises you can try, but a great one for stress relief is mindfulness meditation. Mindfulness is a practice that involves paying attention only to the current moment without any judgment. It can help you stop worrying about things that have already happened or things that may happen in the future. To practice mindfulness meditation, set aside 10 or 15 minutes each day to sit quietly, close your eyes, and just focus on your breathing. Whenever your mind wanders, bring it back to your breathing. Exercise is another good way to relieve stress. It produces endorphins, which are brain chemicals that boost your mood. You don’t have to start an intense exercise routine to relieve stress and control your psoriasis. A few times a week, spend 30 minutes to an hour walking, biking, dancing, or doing any of your other favorite forms of exercise. Many people with psoriasis report that diet changes help their symptoms and prevent flareups. If you’re overweight or obese, making healthy diet changes to lose weight could be very effective for treating your psoriasis. Although it may not make the uncomfortable skin patches go away completely, it could make them much more manageable. Some people with psoriasis are sensitive to gluten, a protein found in wheat, rye, and barley. Eliminating gluten from your diet may improve your symptoms. This is a major diet change for most people, so it will probably take time to adjust. However, after a few weeks of eating a gluten-free diet, you may see a difference in your psoriasis. Others say that going vegan or vegetarian has reduced their flareups. Red meat and dairy products can both cause inflammation, so cutting back or giving them up completely could help. To figure out exactly what foods worsen your psoriasis, you can keep a journal of your meals and your symptoms for about a month. If certain foods trigger the condition, you should start to notice a pattern in the journal. The sun’s UVB rays slow the growth of skin cells, so getting natural sunlight is a great way to treat your psoriasis rashes. However, too much sunlight can be harmful, and you should take care to protect your skin from sun damage. Only expose your skin to the sun for short periods of time, starting with five to 10 minutes per day and gradually staying out for longer. Cover up your healthy skin with sunscreen or clothing, leaving only the affected skin exposed. In addition to providing the helpful UVB rays, sunlight can also help your body make more vitamin D, which fights inflammation. Vitamin D can clear up psoriasis plaques and reduce pain or discomfort. If you get sunburns easily, spending time in the sun may not be the best natural treatment. Also, anyone with a family history of skin cancer should limit how much time they spend in the sun. A warm bath with Dead Sea salts or Epsom salts can relieve inflammation and help with the removal of psoriasis plaques. Soaking in a bath will soften your skin and loosen the psoriasis flakes, so you can remove them by gently rubbing your skin while you rinse off. Add a cup or two of Epsom salts or Dead Sea salts to the running water in your bathtub. You can also add a couple teaspoons of baking soda, which can help relieve itching. Soak for 15 to 20 minutes, and apply moisturizer immediately after you rinse off. Aloe vera gel can help treat a wide variety of skin conditions, including psoriasis. It probably won’t get rid of psoriasis plaques completely, but it can reduce itching and irritation. You can purchase aloe vera gel or cream at most drugstores. To treat psoriasis, apply the gel directly to the affected patches of skin two or three times per day. Applying too much aloe vera for a long period of time can cause some redness or irritation, so you should take a break from the treatment after a month. Fish oil is a popular treatment for many autoimmune diseases. Oral supplements can reduce inflammation, which will help with pain and irritation. Eating salmon or other fish with high levels of omega-3s could provide the same benefits. If you choose to take fish oil supplements, follow the dosage instructions on the label. They can interact with some medications, so you should consult your doctor before you take them. Next article What Is A Gluten-free Diet?